The high-pitched whir of drills and the hiss of steam fill the air inside our state-of-the-art remanufacturing facility in Ridgefield, Washington, as our factory trained technicians begin the technical and complex process of remanufacturing a diesel engine. This is the epicenter of our reman operation. It’s here that we provide our customers an excellent value in extending the life of their machine. We carry one of the largest inventories of engine cores that are ready to be remanufactured to the exact specifications of our customers. 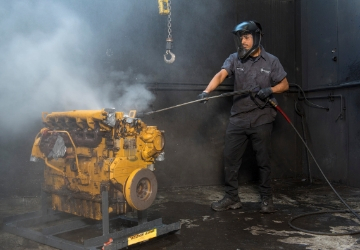 This intense process can give operators an engine that offers up to 50 percent savings over a new engine purchase. Once an engine core has been returned to us from either an operator or OEM we put it through a rigorous 4 step process. We’ll look closely at the initial step in this article. The first step in the process is like the foundation of any building. It needs to be done correctly otherwise the structural integrity of the entire building is jeopardized. The same holds for an engine. It starts with an initial wash. Technicians use a high-pressure hose to steam clean the engine core, said Tim Crace, our production control manager. The core is then disassembled in a careful manner to avoid damaging components and parts used in the remanufacturing process. The cast iron and steel pieces are separated and taken to a wash cabinet that utilizes a caustic solution. The pieces are then rinsed and dried. Smaller components go to a separate cabinet where those pieces are cleaned using a machine that mimics sand blasting. But instead of using sand, a much less abrasive medium like plastic or glass is used. The pieces are rinsed and dried after cleaning. Once the big castings like the block and head are finished in the wash area, we check them using a dry or wet magnaflux process, depending upon the component. “The magnaflux test lets us know for sure whether there are any cracks or defects in the large components,” Crace said. At this point, the engine components are moved to the next steps in the process. But it’s in this initial phase that technicians get an idea as to what parts will be used in the reman and which ones likely need to be replaced or machined. The intricacy of the process explains why it’s critical to have an experienced and highly-trained group of technicians overseeing the reman operation. Learn about the final 3 steps in the Reman Process, Part 2: Final Steps to Deliver Value to Customers.